When most people think of humor and satire, they probably don't turn to 1970s Bulgaria. But if you lived in the U.S.S.R. during that era, chances are high that you did. Deemed the capital of communist humor, Gabrovo, a town smack-dab in the middle of Bulgaria at the foot of the central Balkans, was awarded in 1972 the honor of housing the House of Humor and Satire, a museum-art gallery featuring traditional local humor art, including cartoons, photographs, paintings, sculptures, and verbal humor. In its heyday during the 1970s and 1980s, busloads of Soviet-bloc tourists descended upon the museum. According to the New York Times, "a large staff published books and magazines of satire and humor, hosted a film festival, staged plays, brought in writers from Punch and The National Lampoon, handed out literary prizes to international stars like Joseph Heller and Kurt Vonnegut." Today, however, the House of Humor and Satire stands nearly empty of tourists, a relic of Soviet power now crumbling but still fully functional. cut the tails off of their cats so they can close the door faster when they let the cat out, in order to save heat. turn their clocks off before they go to sleep to save the wear and tear. put green spectacles on their donkeys so that the donkeys will eat shavings, thinking it's hay. invite people to tea and heat the knives so the guests can't take any butter. save money on sweeps by letting a cat down the chimney. A citizen of Gabrovo throws a party, but too many people show up! He goes to his neighbour…. Why don't people from Gabrovo buy refrigerators? Answer: Because they can't be sure the light goes off when the door's closed. Why do people from Gabrovo switch the lamp on and off every now and then when they're reading a book? Answer: To save energy while turning pages. Each joke or saying, it can be assumed, would be even funnier in its proper cultural context and language, but one of the more interesting elements about them is their lack of irony (although the museum's motto, "The world lasts because it laughs" is definitely ironic, especially to Westerners). The jokes and sayings characterize a place where material wealth was, originally, in short supply and wit made up the difference. In the nineteenth century, industry transformed Gabrovo into the "Manchester of Bulgaria," and many joint-stock companies emerged, as well as factories. 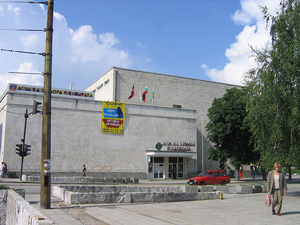 Eventually, the town became a cultural hub of Bulgaria with its Racho Stoyanov Drama Theatre, a puppet theater, the Aleko Cinema, the Etar Architectural-Ethnographic Complex (an open-air museum presenting the customs and culture of Bulgaria) and the National Museum of Education. Also, coincidently, Gabrovo is the "longest town in Bulgaria" at 28 km in length, and recently it was named "The best living town in Bulgaria" and the "Greenest (Eco) city." Communist-era Gabrovo and contemporary Gabrovo share everything and little in common, but its emphasis on the comic arts has always prevailed. The House of Humor and Satire's director, Tatyana Tsankova, recalled that Communist officials in Sofia, "saw this as an ideological opportunity to address the whole world, especially the Western world, and to show that humor could prosper here under Communism, within limits of course." If nothing else, the House has definitely done this. In a time and place characterized by limitations, the House of Humor and Satire showcased the works of abstract and religious artists—"A crucifixion given an ironic title passed as satire…several dozen images of Buddhas, biblical scenes, grim prostitutes on the Rue Saint-Denis, gloomy landscapes, frowning clowns and angular abstractions, all given ridiculous or ironical titles. A sadder group of pictures is hard to envision." Sad, perhaps, but hopeful too—for who knew that humor was not only tolerated but lauded in Communist bloc countries? Even further, as Michael Kimmelman points out in the NYT article, the museum and its humor is a special, "local oddity" in "the more fractured reality of a global age." Like a roadside diner or an antiquated cherry pitter, we cherish what seems old fashioned or, in this case, not so funny. A relic of another time—from the time the Gabrov jokes were originally created to the communist-era museum—Gabrovo represents a glimpse into not only another culture, but another humor.